The Cruiser Tank, Mark V, Covenanter (A13 Mark III), was the fifth ‘mark’ in a series of British designed and built cruiser tanks, and was the third ‘mark’ in the A13 series of British cruiser tanks. The A13 series consisted of, the A13 Mark I, the A13 Mark II, and the A13 Mark III, which respectively were the third, fourth, and fifth marks of British designed and built cruiser tanks. The earlier, first and second marks of British cruiser tanks, were the A9 series (A9 Mark I and A9 Mark I Close Support), and the A10 series (A10 Mark II and A10 Mark IIA). The initial Cruiser Mark V Covenanter (A13 Mark III) pilot model, armed with the 2-pounder Ordnance Quick Firing gun, and co-axial 7.92-millimetre Besa machine gun, mounted in the turret front, and the second 7.92-millimetre Besa machine gun, mounted in the driver’s position, which was dropped from production vehicles, due to the limited space left for the driver, when mounted. Source: IWM (KID 772). In 1936, when considering the future requirements of tanks within the British Army, the British War Office, came to the conclusion, that two tank types would be required in future conflicts, one type being the ‘infantry’ tank, and the other type being the ‘cruiser’ tank. The ‘cruiser’ tank was designed with speed in mind, as their role was envisioned, as that of going through the gaps in the enemies defences created by the infantry and ‘infantry’ tanks, in the attack, and exploiting behind the enemy line, into his rear areas, in order to engage his tanks held in reserve, and to cut his lines of supply and communications. The British concept behind these two types of tanks, came from their experiences during the Great War of 1914-1918, where tanks had developed as infantry support weapons, hence, the concept of the ‘infantry’ tank. On the other hand, the concept of the ‘cruiser’ tank, came about from the traditional role of their cavalry during much of the conflict, that of waiting for a breakthrough to be achieved by the infantry, so that they could ride deep into the enemies rear areas and cut his lines of supply and communications. An example of a standard production Covenanter I, bearing the British War Department number T15488, and armed with the 2-pounder Ordnance Quick Firing gun, and co-axial 7.92-millimetre Besa machine gun. This particular tank, was built under Contract No. T.7218, by Leyland Motors Ltd., at their Kingston-upon-Thames works (London, England). Source: IWM (H 12377). – the A13 Mark III, became the Cruiser Mark V (or Cruiser Mark V* (the asterisk denoting service modifications to the engine cooling system), or the Cruiser Mark V** (the two asterisks denoting that the engine cooling system modifications were built-in). 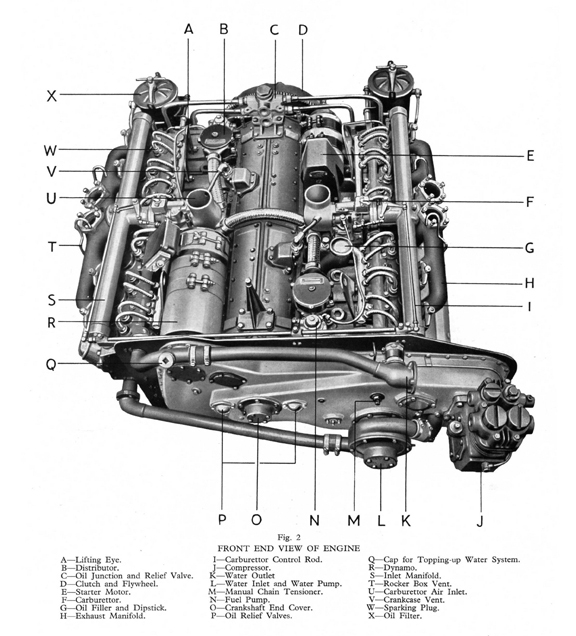 An illustration of the front end view of the Meadows Flat 12-cylinder 300-horsepower gasoline engine, taken from the 1941 First Edition of the Tank, Cruiser Mark V Instruction Book, as prepared by London, Midland and Scottish Railway Company. Source: authors’ collection. – and the name Covenanter IV, was assigned to those tanks built to Covenanter III production standards, but with additional built-in engine cooling system modifications. An example of the Liberty V12-cylinder 340-horsepower gasoline engine. Note the height and slimness of this engine, as compared to the flat and spread-out nature of the Meadows Flat 12-cylinder 300-horsepower engine. Source: authors’ collection. The Cruiser Tank, Mark V, Covenanter (A13 Mark III), came about, in early 1939, when the British General Staff, directed London, Midland and Scottish Railway Company, of Crewe, Cheshire, to design a new cruiser tank, which was to be known as the Cruiser Tank, Mark V, Covenanter (A13 Mark III). 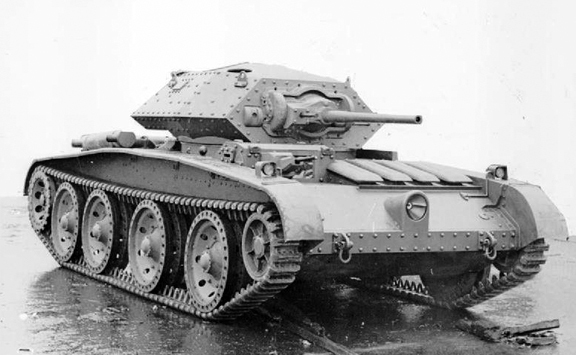 The requirements issued by the General Staff, on 2 February 1939, specified, that the A13 Mark III, was to have a maximum armour thickness of 30-millimetres (later increased to 40-millimetres), it was to be armed with the 2-pounder1 Ordnance Quick Firing gun, and a co-axial 7.92-millimetre Besa machine gun, it was to retain the Christie suspension system2, as used on the earlier A13 Mark I, and the A13 Mark II, and it was to have a lower overall height, then that of the A13 Mark I, and A13 Mark II3. 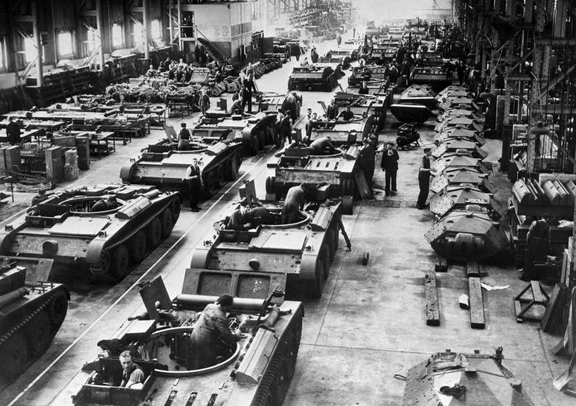 A general view of Covenanter tanks at various stages of production on the assembly line of a factory, somewhere in the United Kingdom, 1941. Source: IWM (P 174). On 17 April 1939, with the threat of war with Germany imminent, one pilot model (Contract No. T.7077) and 100 production vehicles (Contract No. T.6931) were ordered straight off the drawing board, more or less, of London, Midland and Scottish Railway Company. Production of the Cruiser Tank, Mark V, Covenanter (A13 Mark III), was split between London, Midland and Scottish Railway Company, Crewe, Cheshire, English Electric Valve Co., Stafford, Staffordshire, and Leyland Motors Ltd., at their Kingston-upon-Thames works, with deliveries of production vehicles, beginning in November 1940. The last order for 196 Cruiser Tank, Mark V, Covenanter (A13 Mark III), was placed in August 1941. After the initial order of 17 April 1939 (for one pilot model, and 100 production vehicles), an additional 15 production contracts, totalling 1,771 vehicles were placed, and spread between London, Midland and Scottish Railway Company, the English Electric Valve Co., and Leyland Motors Ltd., for the Cruiser Tank, Mark V, Covenanter (A13 Mark III). The Covenanter, had a crew of four (commander, gunner, loader, and driver), it had an approximate battle weight of 18 tons, it was 19-feet, 3/8-inches in length4, and was seven-feet, 3 ¾-inches in height (which made its profile lower then that of the A13 Mark I, and A13 Mark II tanks, by one-foot, 2 ¼-inches), and was eight-feet, 6 ¾-inches wide. It was armed with a 2-pounder Ordnance Quick Firing gun Mark IX or Mark X, and a co-axial 7.92-millimetre Besa machine gun, both of which were mounted in the turret front. Initially, a second 7.92-millimetre Besa machine gun, was to have been mounted in the driver’s position, but this was dropped from production, due to the limited space left for the driver, when mounted. A .303-inch Bren light machine gun, which could be mounted on either side of the turret, for anti-aircraft/ground defence, was also provided. Also, a 2-inch bomb thrower was fitted into the right front turret roof, for the firing of smoke bombs, for the laying of a smoke screen. It had a maximum armour thickness of 40-millimetres, and a minimum armour thickness of 7-millimetres. Steel, instead of aluminum, was used in the production of the road wheels. Riveted construction instead of welding, was used, vertical surfaces were avoided, which resulted in an almost flat hull. Even a new lower turret was designed, which resembled a ‘squashed’ version of the type used on the A13 Mark II, although in reality it was a completely new design, though still mounting a 2-pounder, and co-axial 7.92-millimetre Besa machine gun. The turret was fitted with a full-width top hatch, which became known as a ‘sunshine roof,’ which opened horizontally, and slid backwards on parallel link arms. Front view of a Covenanter IV, of Headquarters, 1st Canadian Army Tank Brigade, armed with the 2-pounder Ordnance Quick Firing gun, and co-axial .7.92-millimetre Besa machine gun. 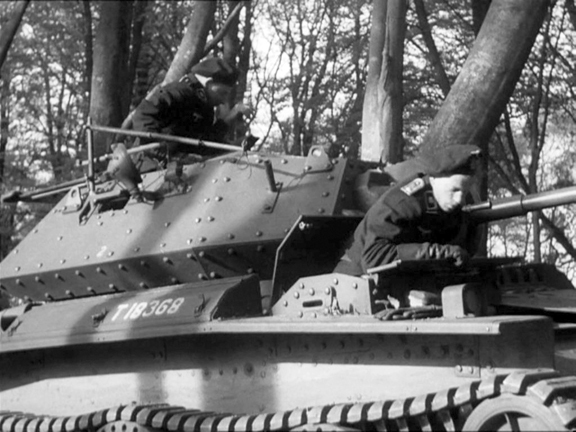 The barrel of the anti-aircraft/ground defence .303-inch Bren light machine gun, connected to the Lakeman anti-aircraft mount, can be seen, just above the driver’s right shoulder, and behind it, the spotlight, which was standard on British tanks of the period, and in the case of the Covenanter, was mounted on the right-side of the turret. 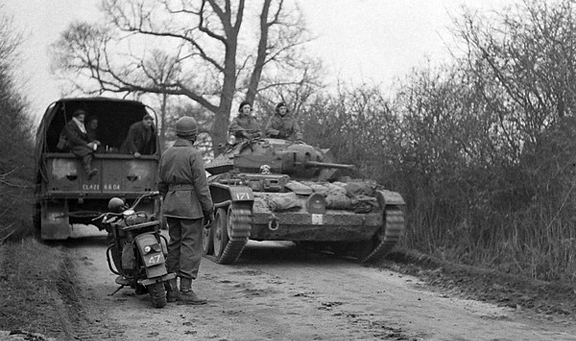 The number ‘171,’ which appears on the right-front track guard, is the Arm of Service marking, by which vehicles belonging to Headquarters, 1st Canadian Army Tank Brigade, were identified, from August 1941 to May 1943. This Arm of Service marking, consisted of the number ‘171,’ in white, centrally located on a horizontally divided blue over brown coloured square. The white square, directly below the headlamp housing, is the centre portion, of the ‘Armoured Fighting Vehicle Recognition Sign,’ which was used as a form of “National Identification” marking for British and Canadian armoured fighting vehicles, of the period. It consisted of a 10-inch high by 18-inch wide rectangle, which was divided vertically into three 6-inch wide red/white/red strips. Source: MilArt photo archive. Internal stowage bins for 109 rounds of 2-pounder ammunition, 18 boxes of 7.92-millimetre ammunition5, 26 rounds of 2-inch Bomb, smoke, and 600 rounds of .303-inch ammunition6, along with other miscellaneous items, were provided for. Like most other British tanks in service at this time, external stowage bins and containers (for various tools, and crew equipment), were also provided for, along with the standard compliment of pioneer tools (shovel, crowbar, pickaxe) and recovery/breakdown equipment (tow rope, jack and wood blocks), which were carried on all tanks. A Covenanter IV, of Headquarters, 1st Canadian Army Tank Brigade, passing troops of an unidentified Canadian unit, while on exercise, somewhere in the United Kingdom. Source: MilArt photo archive. The Covenanter, was powered by a Meadows Flat 12-cylinder 300-horsepower gasoline engine, and had a maximum speed of 31-miles per hour, and a cross-country speed of approximately 25-miles per hour. Three interconnected fuel tanks were located in the engine compartment, one on either side of the engine, and one below the engine, and an auxiliary fuel tank, which was mounted on the exterior of the rear hull, which was connected to the main fuel system, but could be jettisoned from the tank in an emergency7. 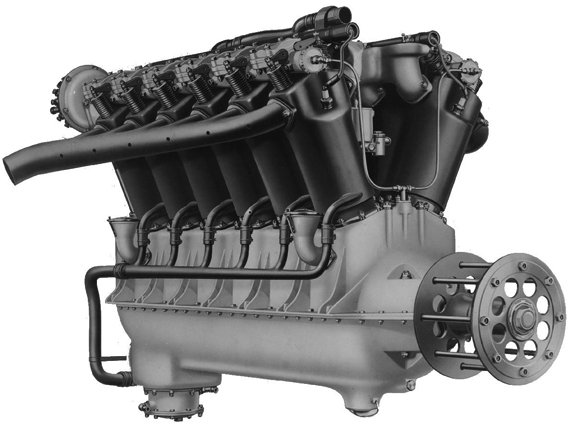 Because a Meadows Flat 12-cylinder 300-horsepower gasoline engine was used, instead of the Liberty V12-cylinder 340-horsepower gasoline engine, as used in the earlier ‘marks’ of the A13 series, the engine cooling radiators could not be fitted into the engine compartment, at the rear of the tank. Instead they had to be mounted in the front-left of the tank, which meant that he drivers’ compartment, was moved to the front-right of the tank, with the radiators to his left. 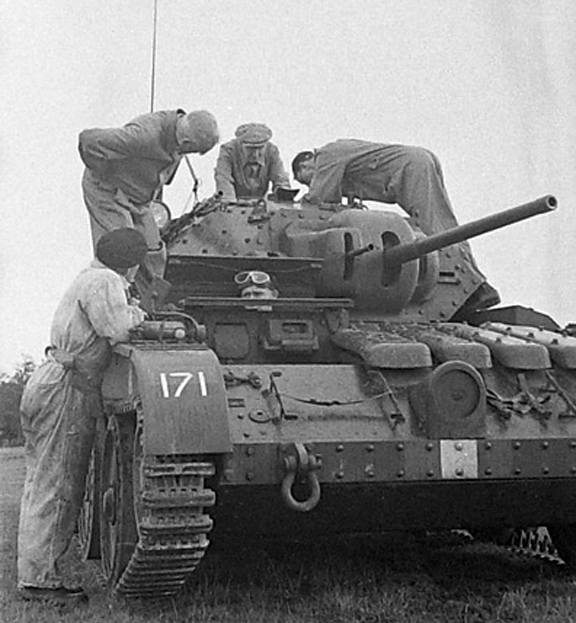 The mounting of the radiators at the front of the tank, instead of in the engine compartment at the rear of the tank, resulted in constant overheating along with other mechanical problems. In order to rectify the cooling system problem, various modifications were required in subsequent production vehicles, in order to correct the vehicle’s overheating, which in the end, was never satisfactorily overcome8. 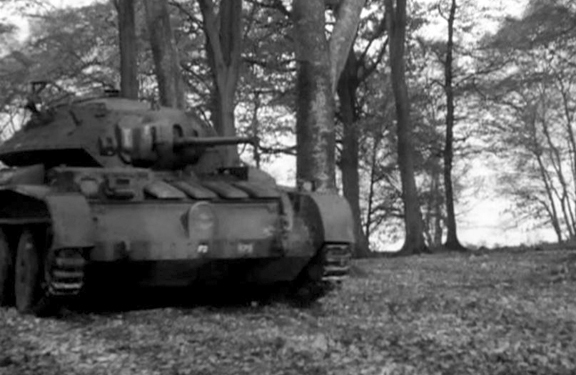 T18368, a Covenanter I, which was issued to Headquarters, 1st Canadian Army Tank Brigade, on 5 August 1941, taking part in the filming of a British Military Training Film, entitled ‘Ten Tips for Tackling Tanks,’ in the fall of 1941, for which the crew is dressed as a German tank crew. The Covenanter driver’s compartment was notably cramped, as is illustrated here, note, there isn’t too much room between the driver, who is leaning on the folded down hinged front section, and the hinged two-piece rear section, of his hatch. Note the short pipe, on the turret side, just behind the driver, this was for the barrel of the anti-aircraft/ground defence .303-inch Bren light machine gun, to rest on when connected to its Lakeman anti-aircraft mount (a portion of which is visible), when not in use. The number ‘2,’ which appears midway along the turret side, indicates, that this is the number two tank of brigade headquarters (see the next caption for details). Source: authors’ collection. Another view of T18368, while taking part in the filming of ‘Ten Tips for Tackling Tanks.’ The ‘F2,’ in the centre of the nose plate, directly below the headlamp, indicates, that this tank is the number two tank of the ‘Fighting Group’ (commonly referred to as the ‘Fighting Troop’) of the brigade headquarters, with the other three tanks bearing the markings ‘F1,’ ‘F3,’ and ‘F4,’ respectively. To the left of the ‘F2’ marking, can be seen the Arm of Service marking (‘171’) of the brigade headquarters, as explained earlier. The marking that appears above left, of the Arm of Service marking, is that of the Formation sign (by which the formation that the unit operating the vehicle belonged to, was identified), used by the 1st Canadian Army Tank Brigade, from mid August 1941 to mid October 1942, which consisted of a gold or yellow maple leaf centred on an eight-inch by ten-inch square black background, with a black left-facing image of a ram superimposed centrally on the maple leaf. Source: authors’ collection. 1st Canadian Army Tank Brigade was to have been equipped with the Canadian-built Infantry Tank, Mark III, Valentine, before leaving Canada. However, because of delays in Canadian tank production, Lieutenant-General McNaughton set out to persuade the British War Office to lend tanks to the incoming 1st Canadian Army Tank Brigade. These would be replaced with Canadian-built tanks when Canadian production problems were overcome. With the added support of the British Army’s Commander of the Royal Armoured Corps, Major-General G. Le Q. Martel, he was successful in this endeavour. Immediately upon arrival in the United Kingdom, 1st Canadian Army Tank Brigade was able to draw equipment on a respectable training scale. The Ontario Regiment was equipped with the new Infantry Tank Mark IV, Churchill (A22), straight from the Vauxhall Motors production line, while the brigade’s other two battalions, the Three Rivers Regiment and the Calgary Regiment were issued with the Infantry Tank Mark IIA*, Matilda III. At the time that Headquarters, 1st Canadian Army Tank Brigade arrived in the United Kingdom, the war establishment of an army tank brigade headquarters, under which they were organized, authorized the entitlement of four cruiser tanks, for the ‘Fighting Group,’ of the brigade headquarters. To this end, two of the British Army’s new Cruiser Tank, Mark V, Covenanter (A13 Mark III), bearing British War Department numbers9 T7127, and T18715, respectively, were issued to Headquarters, 1st Canadian Army Tank Brigade, on 10 July 1941. T7127, had been built under contract number T.6931, by London, Midland and Scottish Railway Company, while T18715, had been built under contract number T.7219, by the English Electric Valve Co. On 5 August 1941, the last two, Covenanter I tanks, bearing British War Department numbers T18366, and T18368, both of which had been built under contract number T.104, by the English Electric Valve Co., were issued to Headquarters, 1st Canadian Army Tank Brigade, thus bringing them up to their full establishment, of four cruiser tanks. 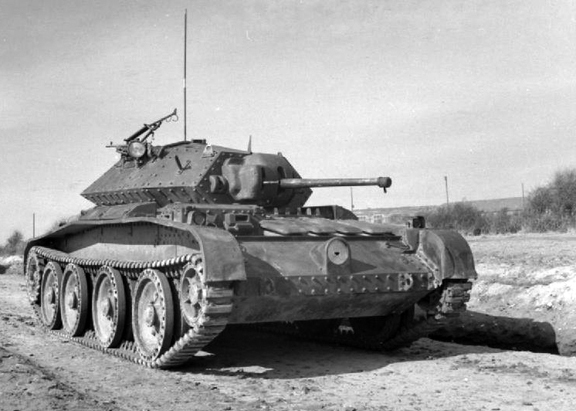 As mentioned previously, with the change in the nomenclature of British tanks, in July 1941, the Cruiser Mark V, became known as the Covenanter I, which was the type of tank that Headquarters, 1st Canadian Army Tank Brigade, was issued with on 10 July and 5 August 1941. Although, now known as the Covenanter I, it wasn’t until December 1941, that this designation began to appear in ‘Tank States/Returns,’ of the period, in the United Kingdom, up until December, they appeared as Cruiser V tanks. All four of these Covenanter I tanks (T7127, T18366, T18368, and T18715), despite having the cooling system problem of the basic production model, remained in working order from the time of their issue to Headquarters, 1st Canadian Army Tank Brigade, to the time they were withdrawn, for return to the British in April 1942, as all, were reflected as ‘ready for battle,’ on the ‘State of Readiness Return,’ for the months of July 1941, through to April 1942. 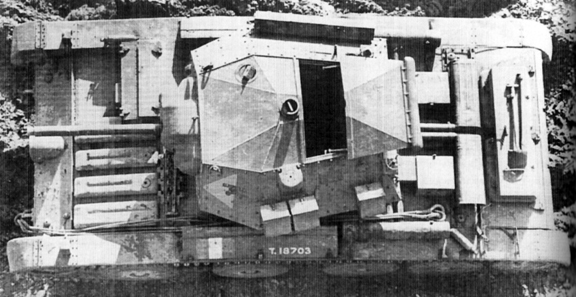 An overhead view of a Covenanter I, in British service, bearing British War Department number T18703, which was built under Contract number T.7219, by English Electric Valve Co., showing the driver’s hatch in the closed position, and the turret full-width top hatch, in the open position. The three small external stowage bins, on the left-side of the turret, each held two 100 round drums of .303-inch ammunition, for the anti-aircraft/ground defence, .303-inch Bren light machine gun. The long bin on the right-side of the turret, was for the stowage of the .303-inch Bren light machine gun, when not in use. The marking on the front left-side of the turret, is that of the British Royal Armoured Corps Gunnery School, which was located at Lulworth Camp, Dorset. Source: authors’ collection. Near the end of April 1942, all four of these Covenanter I tanks, were withdrawn from service with Headquarters, 1st Canadian Army Tank Brigade, and sent to No. 1 Canadian Base Ordnance Depot, Royal Canadian Ordnance Corps, located at Bordon Camp, Hampshire, where they were inspected for any mechanical faults, and insuring that all the appropriate tank tools and equipment for each individual tank were in place, and if not, noting what deficiencies there were, before they were passed back to the British. Covenanter I tanks, T18366, T18368, and T18715, were returned to the British, from No. 1 Canadian Base Ordnance Depot, on 10 June 1942, with T7127, following on 16 June. Of interest, T7127, and T18366, went to the British Guards Armoured Training Regiment, while T18368, and T18715, went to the 54th Training Regiment, Royal Armoured Corps. 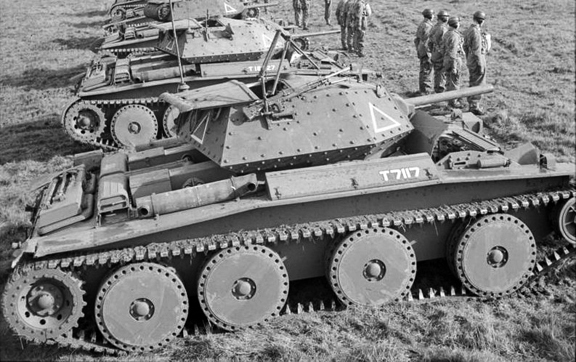 To replace these four Covenanter I tanks, Headquarters, 1st Canadian Army Tank Brigade, were issued with four of the newly built, Covenanter IV tanks, which were built to Covenanter III production standards (built-in engine cooling modifications), but with additional built-in cooling system modifications. On 29 April 1942, two Covenanter IV tanks, bearing British War Department numbers T81688, and T81718, respectively, both of which were built under contract number T.2075, by the English Electric Valve Co., were issued to Headquarters, 1st Canadian Army Tank Brigade. This was followed on 30 April, by the issue of the last two Covenanter IV tanks, bearing British War Department numbers T81692, and T81738 respectively, again, both of which were built under contract number T.2075, by the English Electric Valve Co. These four Covenanter IV tanks, from the time they were issued, until withdrawn from service with Headquarters, 1st Canadian Army Tank Brigade, were all reflected as ‘ready for battle,’ on the ‘State of Readiness Return,’ for the months of May 1942, through to March 1943, except for February 1943, when one was in workshops for minor repairs. On 19 March 1943, the Canadian Army Overseas, decided to immediately re-equip the 1st Canadian Army Tank Brigade, with the Canadian designed and built, Cruiser Tank, Ram, Mark II10. This decision was followed shortly afterwards, by that of re-equipping all Canadian Armoured Corps formations overseas with the American designed, Medium Tank, M4 series, Sherman, instead of with the Canadian Ram tank. Through the spring of 1943, the four Covenanter IV tanks, of Headquarters, 1st Canadian Army Tank Brigade, were withdrawn from service, and returned to the British, and were replaced with four Sherman V11 tanks. Although the Covenanter I, was deemed unfit for foreign service, and the Covenanter IV, was deemed fit for foreign service, only ‘in an emergency,’ because of the ongoing cooling system problems with the A13 Mark III series, both types, fulfilled their roles, of equipping the ‘Fighting Group’ of Headquarters, 1st Canadian Army Tank Brigade, with the four cruiser tanks, to which they were entitled to, so as to enable the brigade headquarters, to carry out and take part in, the mobile tank training of 1st Canadian Army Tank Brigade, as a whole. This however, is not the end of the story of the Covenanter in Canadian service, the Covenanter Bridgelayer also served within Canadian armoured formations, but that is another story, for another day. The author wishes to thank Miss Courtney Carrier, for proofing reading and offering constructive criticism, and comments, on my draft copy of this article, and Peter Brown, for his assistance with relevant material, and his constructive criticism, and comments, on the draft, and Clive M. Law, for providing photos from the MilArt photo archives, and relevant material, and for publishing this article, and lastly, my wife, Denise, for her never-ending support and understanding. Any errors or omissions, is entirely the fault of the author, who unfortunately, cannot always remember everything. 1. The 2-pounder (40-millimetre) Ordnance Quick Firing gun, was the heaviest gun fitted to British tanks from 1939 to 1942, when it was superseded by the 6-pounder (57-millimetre) Ordnance Quick Firing gun. 2. 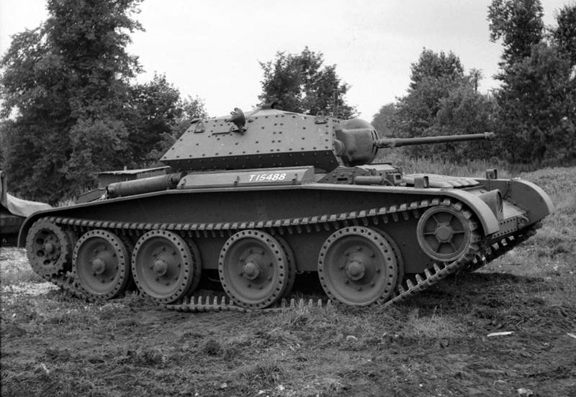 The Cruiser Tank Mk III (A13 series) was the first in a long series of British cruiser tanks to feature the Christie suspension system, which had been developed by the American inventor J. Walter Christie. It allowed for independent suspension of each road wheel, which allowed considerably longer movement than conventional leaf spring systems then in common use, which allowed tanks to have considerably greater cross-country speed. 3. Both the A13 Mark I, and A13 Mark II, stood at a height of eight-feet, 6-inches. 4. 19-feet, 6-inches if the auxiliary fuel tank was fitted. 5. Each box contained one belt of 225 rounds of 7.92-millimetre ammunition, for a total of 4,050 rounds of 7.92-millimetre ammunition. 6. Carried in six drums of 100 rounds each. On some tanks, these were carried in three stowage bins on the upper left side exterior of the turret, with each bin holding two 100 round drums of .303-inch ammunition. 7. The two side fuel tanks had a capacity of 28 gallons (127 litres) each, the bottom fuel tank had a capacity of 36 gallons (164 litres), and the auxiliary fuel tank had a capacity of 33 gallons (150 litres), for a total fuel capacity of 125 gallons (568 litres). 9. In order to provide a positive means of identifying individual vehicles, every British military vehicle was given a separate serial number with a prefix letter denoting the type of vehicle, which for tanks, was the letter ‘T’. These numbers were officially known as War Department numbers, but were commonly referred to as Census numbers, in Canadian service, and were normally stencilled onto the vehicle in white letters 3 ½-inches high. 10. The Canadian designed and built, Cruiser Tank, Ram, Mark II, was armed with a 6-pounder (57-millimetre) Ordnance Quick Firing gun, and three .30 Calibre (7.62-millimetre) Browning machine guns, one of which was mounted co-axially in the turret with the 6-pounder, while another, was mounted in an auxiliary turret, located on the left front of the tank, or in later production vehicles, without an auxiliary turret, in a ball mount in the left front hull. The third .30 Calibre Browning machine gun, was mounted beside the commander’s hatch, on the turret roof, and used for anti-aircraft/ground defence. 11. The Sherman V, was the designation used for the American standard production Medium Tank, M4A4, Sherman tank, in British and Commonwealth service. It was armed with a 75-millimetre gun, and two, or three .30 Calibre (7.62-millimetre) Browning machine guns (one co-axially in the turret with the 75-millimetre gun, and one in a ball mount in the right front hull). In some cases, the third .30 Calibre Browning machine gun, which was used for anti-aircraft/ground defence, was replaced by a .50 Calibre (12.7-millimetre) Browning heavy machine gun.